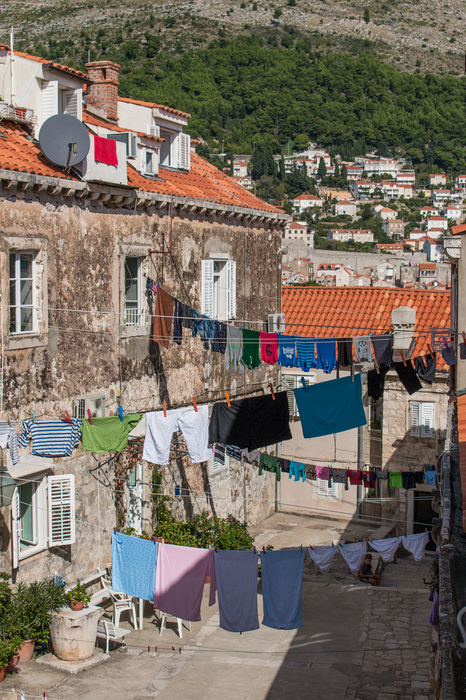 You know those ambitious lists of things to in Dubrovnik that are designed to inspire your next holiday on the Adriatic coast… they are jam-packed with with 10 or 15 or even 20 items. It can be very overwhelming! So I’ve kept it simple this time and reduced our list to 3. Yep, just 3. And to make your life even easier, the 3rd one can easily be skipped or use our travel hack to do it much, much cheaper. 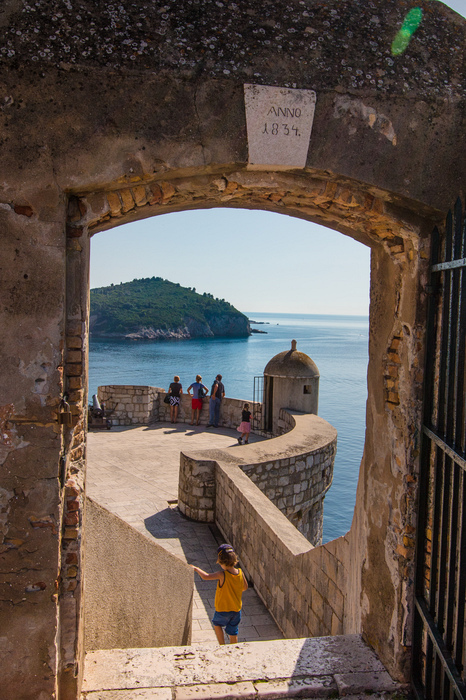 Without further ado, our list of 3 things that you want to do before leaving Dubrovnik. 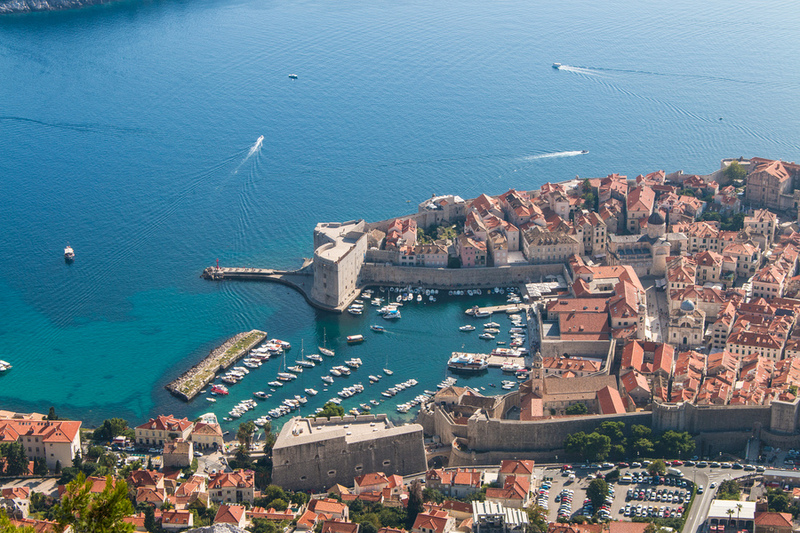 When we saw the Old City in the distance, it sat proudly surrounded by its thick medieval walls, almost like a mini Jerusalem replicated in Eastern Europe and placed on the shores of the sparkling Adriatic Sea. And just like Jerusalem the best view of Old City Dubrovnik was from the top of its historic walls as well as from the top of a nearby mountain (just like the Mount of Olives in Jerusalem). 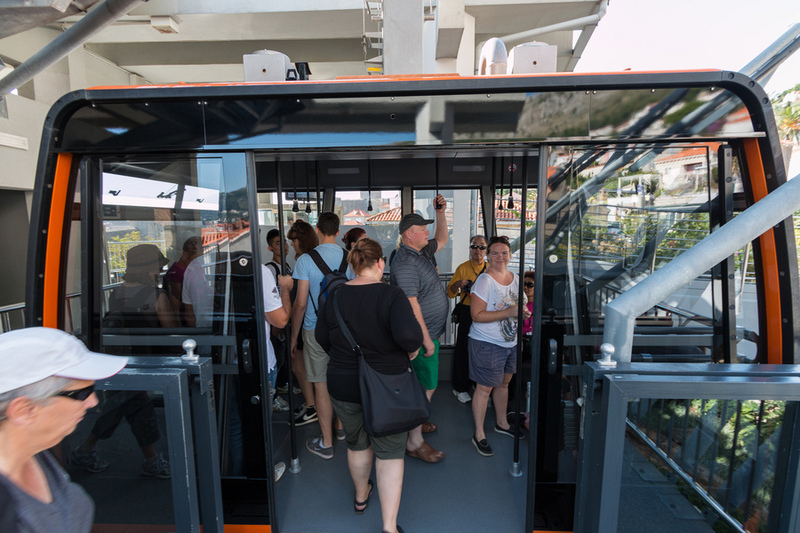 On our first day in Dubrovnik we met our friends, Hai and Jessica (from Notes of Nomads) at Pile Gate and we headed straight for the ticket booth. Tickets were 70 kuna per adult (US$11) and 30 kuna per child. When walking in through Pile Gate we found the large fountain-style statue and the ticket booth was tucked away on the right side. Tickets in hand, we walked to the left up the large stone steps to the top of the walls. It was quite a climb. 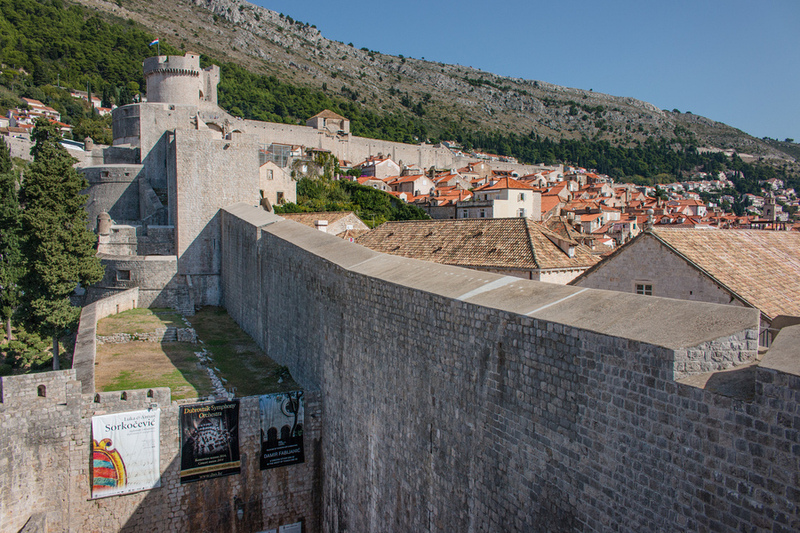 Unlike Jerusalem, the Dubrovnik walls actually have several cafes along the route where you can conveniently stop for a tourist-priced drink and much-needed shade. But like Jerusalem the rest of the walls are hot under the scorching sun, so bring plenty of water and a hat (and sunscreen). The view from the walls was pure pristine panoramic glory. 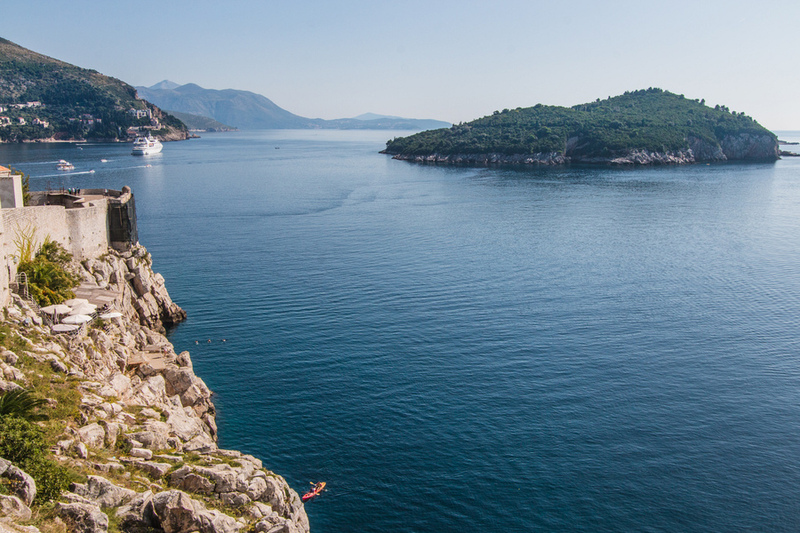 The jaw-dropping views stretch for miles and we could see the whole city plus the unbelievable drops where the walls were built right into the edge of steep cliffs above the sparkling, turquoise Adriatic Sea. 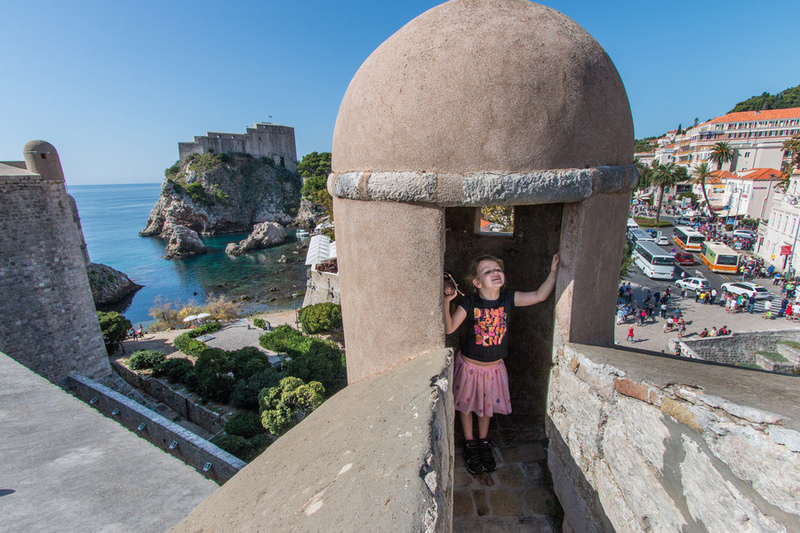 The kids enjoyed running around, hiding in small towers sprinkled around the walls or climbing on the hefty black canons. 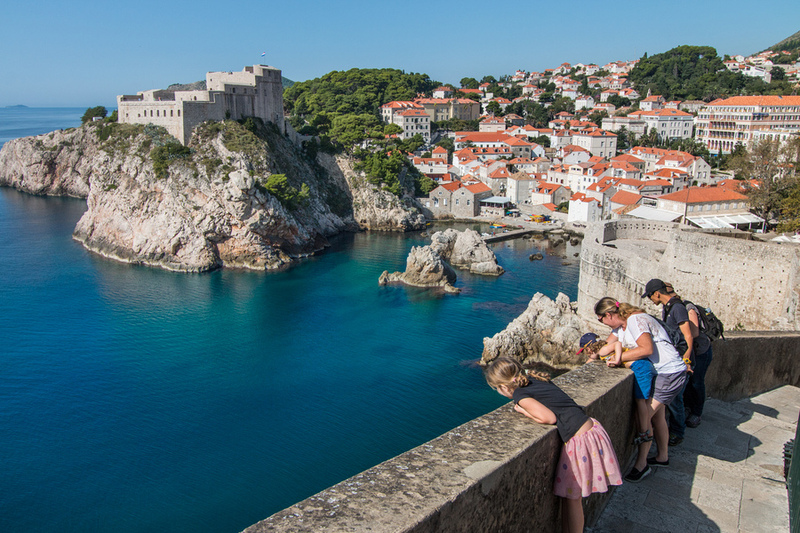 Josh was in heaven taking one eye-popping scenic photo after another that resulted in an amazing Dubrovnik photography tour post. And I relished the fascinating history as well as watching my kids and husband fully enthused in what they were doing. It took us a good few hours to cover half the city wall. Once the ocean met the land at the south end of the city we decide to head down for lunch. We skipped the eastern side and best views of the majestic tower, but the sun was getting hot and our tummies were starting to rumble. Absolutely! 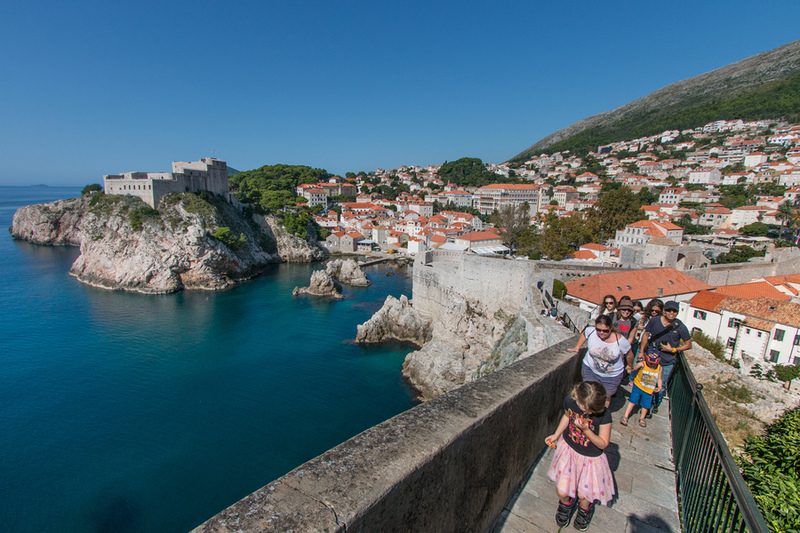 This was my favourite thing to do in Dubrovnik and I highly recommend it, whether you are visiting for 1 day or 1 week. Worth every penny! 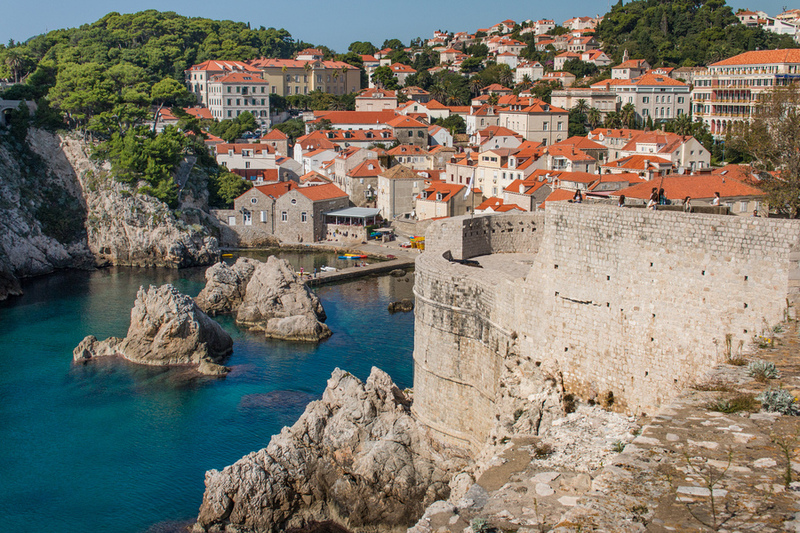 Better known as Kings Landing, Dubrovnik sets the scene for one of the world’s most popular TV series. The walking tour from Tours By Locals happens to be their most popular tour anywhere in the world, and for very good reason too. So book this in advance to avoid disappointment. If you’re a fan of the TV show, then this tour is a must. 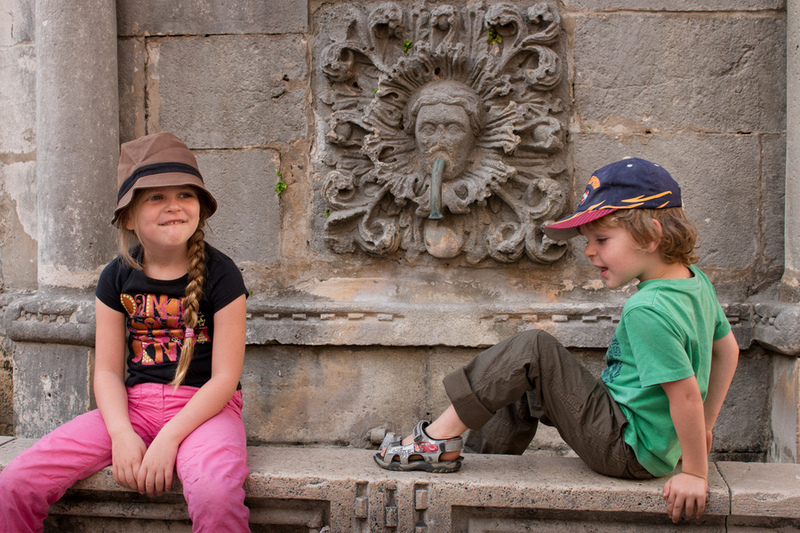 Read more about our GoT tour experience. 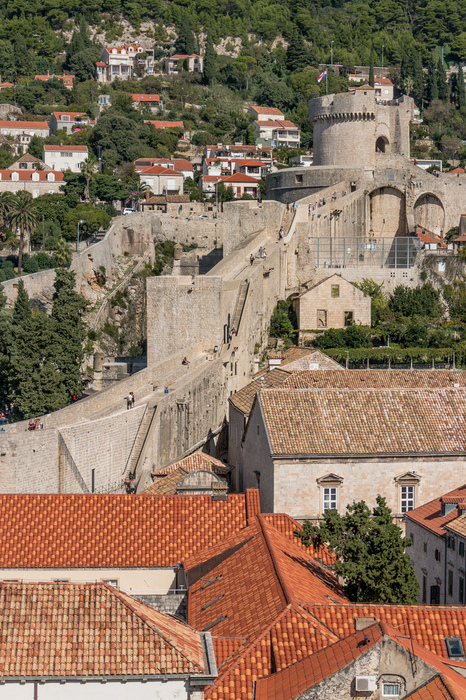 With two avid photographers in our group we were drawn towards the next best thing after walking the walls… being above the walls. 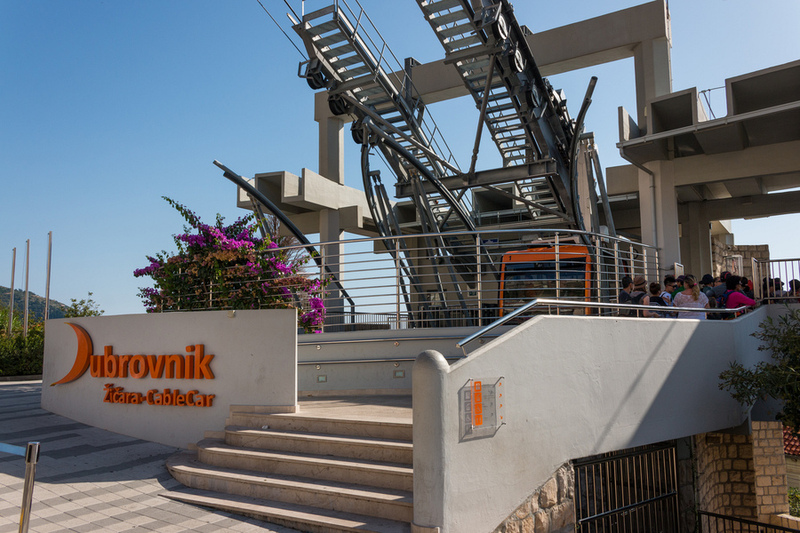 So we took the Dubrovnik Cable Car on the 4-minute ride up Mount Srd. The cost was 100 kunas each (US$15), kids half price, so for a round 8-minute trip for 2 adults and 2 kids the total cost was US$45. More then any cable car or gondola ride we took in Luxembourg or Switzerland by a healthy margin! The top of the mountain was brimming with tourists and trying to dodge them became a skilled game of cat and mouse. Finally we withdrew from the beautiful glass balconies and strolled outside to the large memorial cross you can see from city. 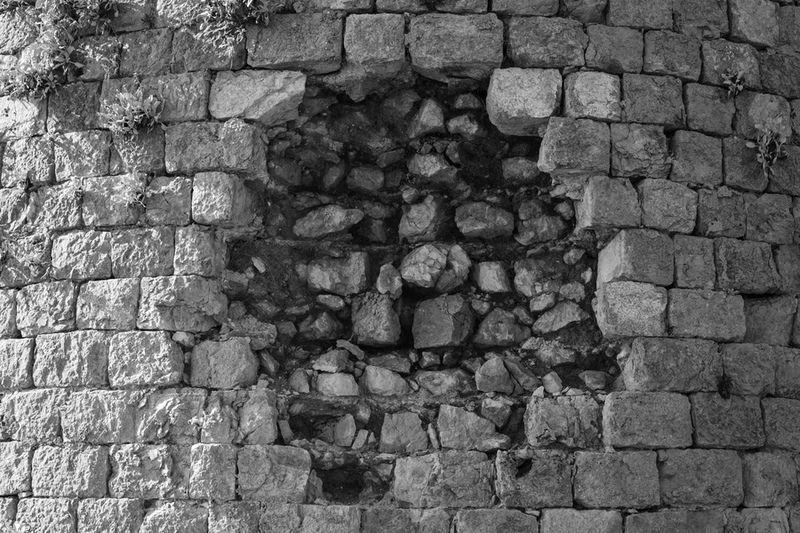 During the Siege of Dubrovnik in 1991 Mount Srd was the base from which the JNA (Yugoslav Army) shelled the city. 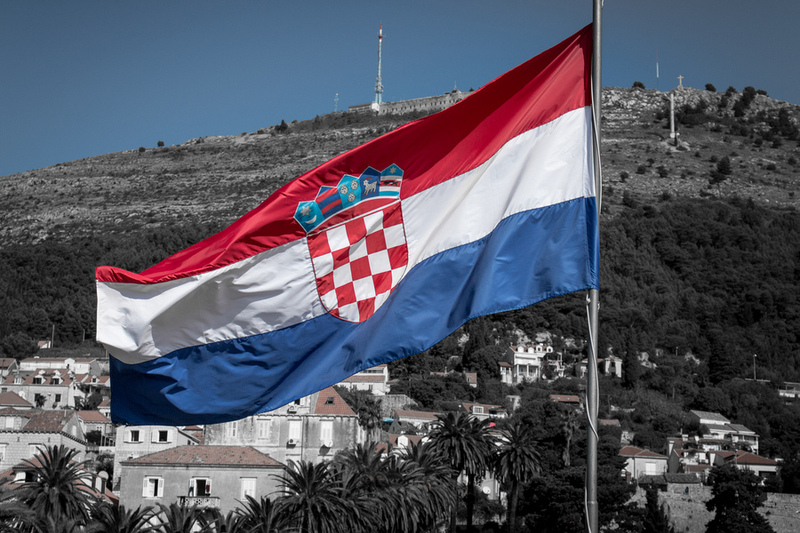 A memorial that previously stood on the hill was damaged during the war, and afterwards the memorial was re-built and dedicated to the victims of the Croatian War of Independence. It was quite sobering sitting in the shadow of history, quite literally, and contemplating what humans are capable of – both amazing and horrific. At the cross Josh dashed off to take an abundance of aerial photos of the Old City and surrounding area while I bumped into a couple from the United States on holidays. I ended up chatting to them for quite some time until the sun scorched my scalp and we said our farewells. We took the cable car back down the mountain and walked 15 minutes to the bus stop near Pile Gate. 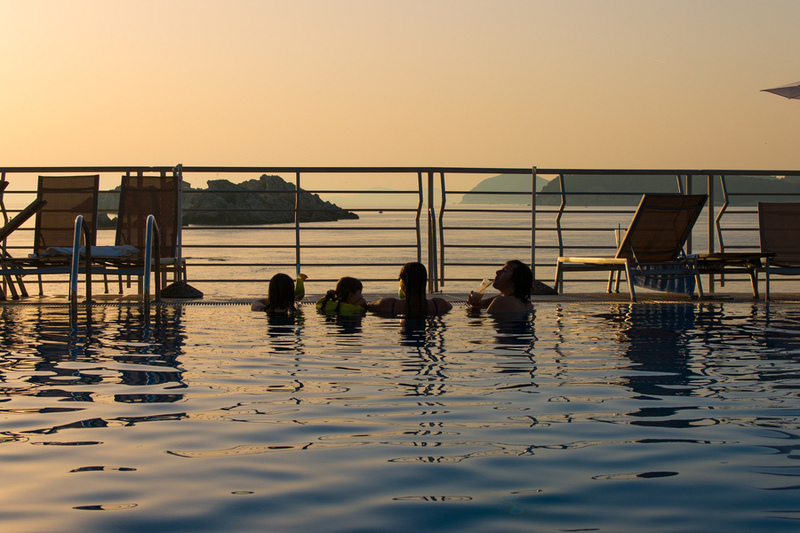 We couldn’t wait to make the most of our hotel pool and the hot summer sun… oh yeah, and the swim up bar. Ending the day with a Hawaiian cocktail in the infinity pool overlooking the sea was more memorable then our pricy cable car up the mountain. Hmmmm, no. US$45 for an 8-minute cable car felt like it burned a hole in our pockets. It’s clearly an attraction aimed at cruise ship tourists who are on a very limited schedule. With our rental car, we could have just as easily driven up the mountain and it would have cost a lot less. Personally I would skip the cable car and try to find a taxi or your rental car to drive up (it’s a narrow, steep road, but quite drivable). The cable car was a tourist trap we fell for hook, line and sinker. But the views on the other hand… well, that’s another story. 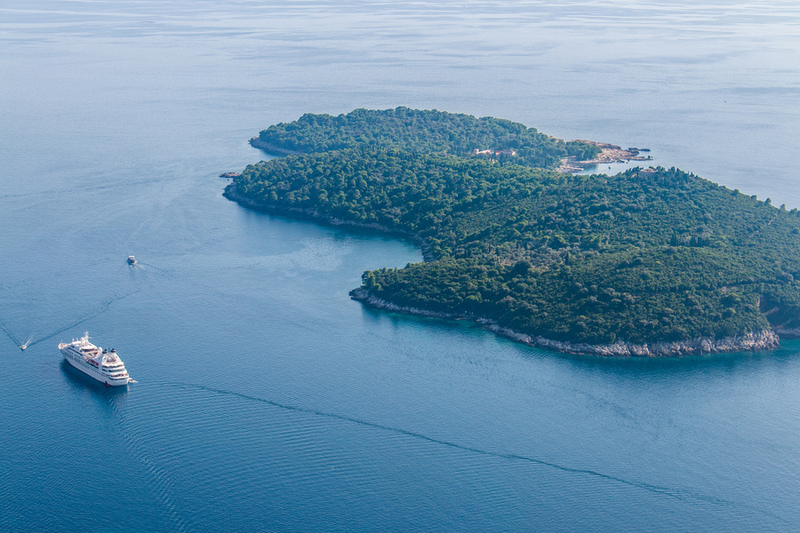 If you want to see Dubrovnik from a different angle, consider a luxury gulet cruise (boat/yacht). 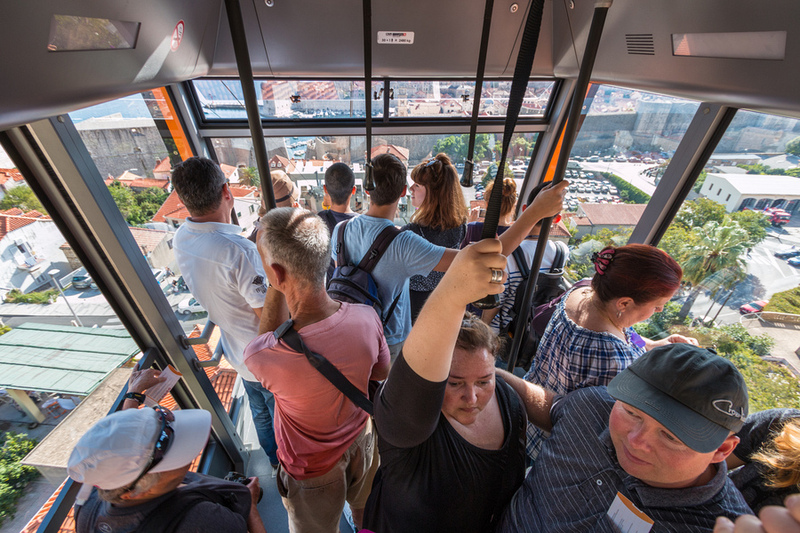 If you travel as a large family group or a getaway with friends, this can be a surprisingly affordable way to see the Dalmatian coast. 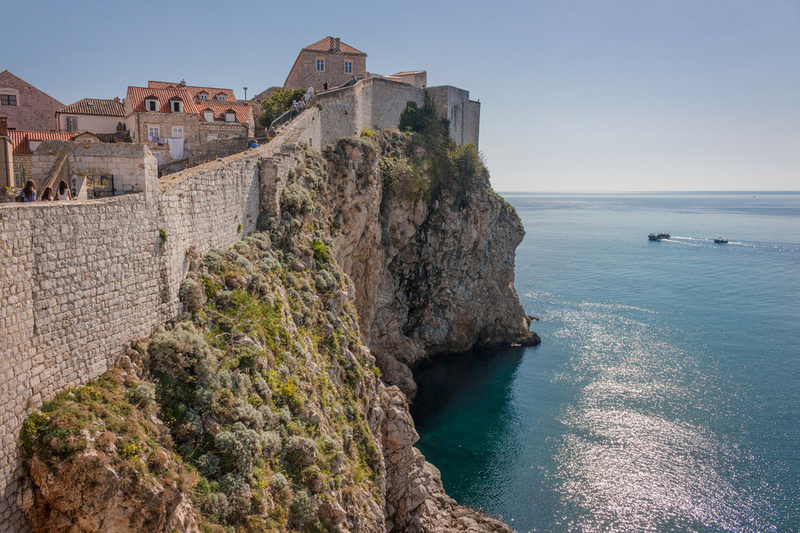 By no means are there just 3 things to do in Dubrovnik. We could have spent 3 weeks here and still not seen everything we wanted to. But considering most visitors arrive on a cruise ship or take a weekend break (like we did), a small list seems so much more practical and less daunting. Don’t you think? I agree, this place has a magnificent view. Love the photos! Your photos are always so good, clear and download quickly. 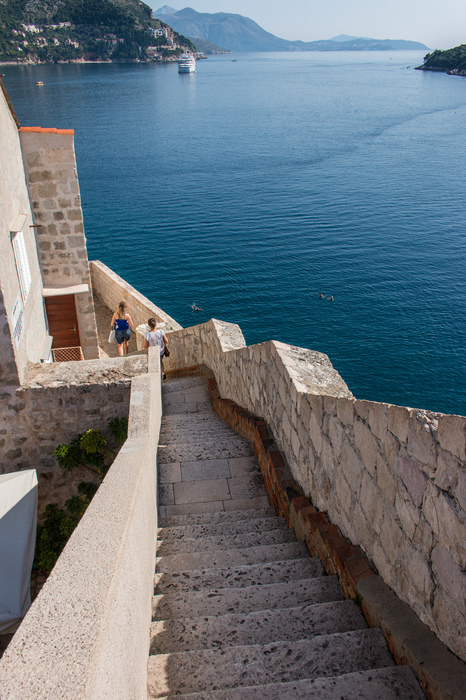 Croatia is one of our favourites, and Dubrovnik very special. We also did the walk around the walls. When we went (circa 2004), the cable car had not been rebuilt after the war, so I walked up the zig zag path. As one got towards the top, there were signs on each corner marking the stations of the cross counting down. At the top I climbed onto the walls where one coujld still see some of the debris of war. Trenches, dug outs, rusted chairs from when the cable car used to work. And best of all was some graffiti written on the wall with a date of the 25th December (don't remember the year). That wold have been written when the war was ongoing, and the young men up there were shelling the city below. Christmas Day. Very poignant. A far cry from today's tourists. Finally! A blog with great photos and details of Croatia. Will be heading there in a week. I'm excited. By the way, fantastic photography! 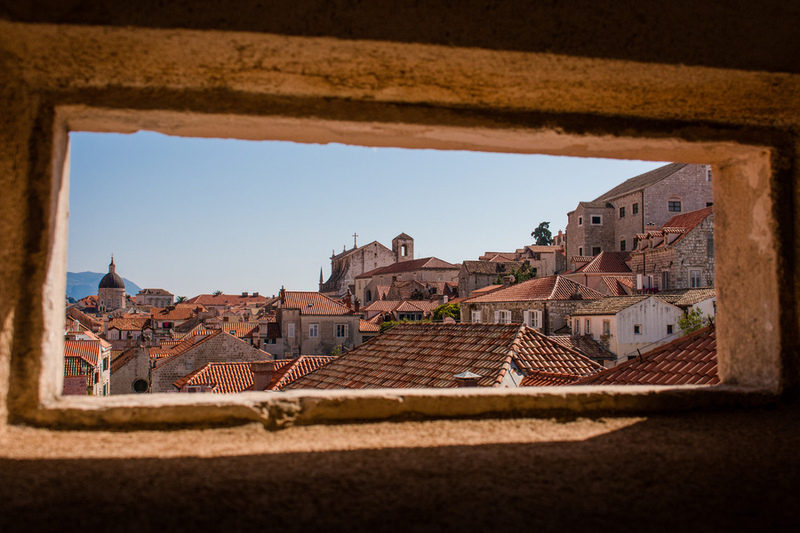 Lovely blog article about Dubrovnik! I agree, the wall tour is absolutely a must. Typical tourist thing but a must! The views over the sea are amazing. Besides that Dubrovnik has some lovely loungy coffeebars and good restaurants, perfect to spend an evening and taste the unique atmosphere of the city. 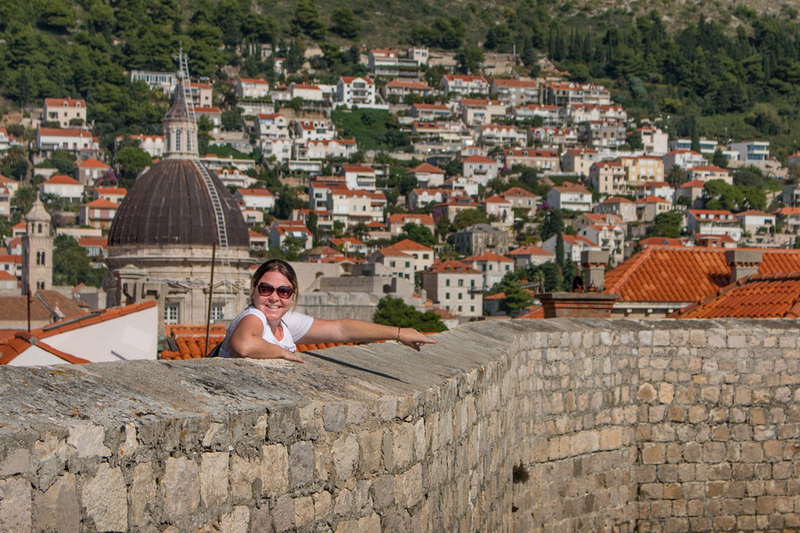 I wouldn't spend more than 2 days in Dubrovnik as Croatia has lots more to offer like Split, Krka, Makarska and Hvar.